The reviews are in for Nina: A Story about me & Nina Simone ! Josette Bushell-Mingo, and her three piece band, mix story and song as she draws together tales from the life of Nina Simone, Josette’s own extraordinary career and the Black Lives Matter movement. This production is all sold out but you are welcome to join our returns queue from 6.45pm each night. You can read the reviews below and check out what audiences have been saying so far in our Storify round up. Nina: A Story about me & Nina Simone runs in the Young Vic Maria studio until 29 July before it heads to the Traverse Theatre at the Edinburgh Fringe Festival. A Streetcar Named Desire has opened to rave reviews at St. Ann’s Warehouse. Gillian Anderson is Blanche DuBois, Ben Foster is Stanley and Vanessa Kirby is Stella in Benedict Andrews’ award-winning production, which transferred to New York following a sold-out run at the Young Vic last summer. Read the reviews below and view the full selection of production photos on Facebook. See Gillian Anderson as Blanche DuBois in our Young Vic short film, The Departure, inspired by A Streetcar Named Desire. The film takes place in the days before Blanche arrives at her sister Stella’s home. Directed by Gillian Anderson and written by Andrew O’Hagan. A Streetcar Named Desire plays in New York at St. Ann’s Warehouse until 23 June. Visit their website to book tickets. Richard Jones’ production of Kafka’s The Trial has been wowing audiences and critics alike. Click here to see the audience feedback so far and read the reviews below. WhatsOnStage – read the full review here. Daily Mail – read the full review here. Check out the production photos for the show on Facebook. The Trial runs at the Young Vic until 22 August. Book now. Heather Lai and Lucy Ellinson (standing) and audience members in World Factory. Photo by David Sandison. The reviews are in for World Factory. Read below to find out what the critics think and click here to see the amazing audience response so far. The Independent – read the full review here. 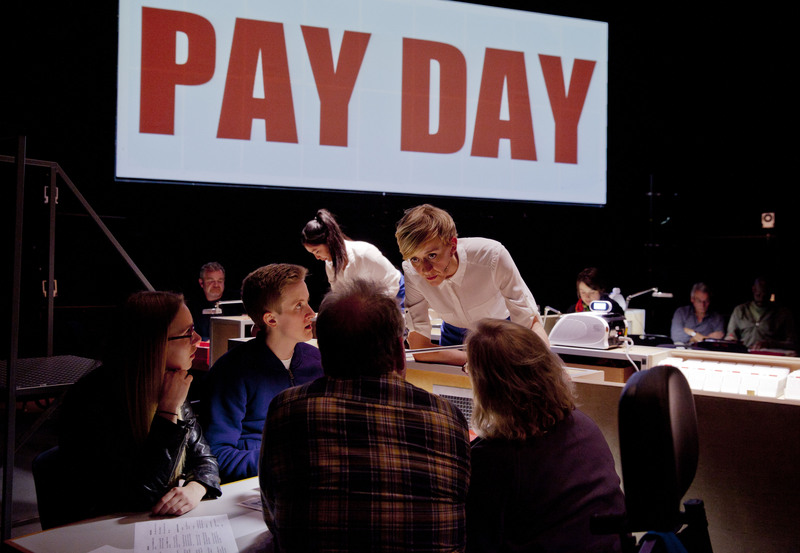 World Factory runs at the Young Vic until 6 June. Book now. Sam Troughton, Adam James, Eleanor Matsuura in Bull at the Young Vic. Photo by Simon Annand. The reviews are in for Bull. Read below to find out what the critics think and click here to see the amazing audience response so far. Daily Telegraph – read the full review here. The Times – read the full review here. Bull returns to the Young Vic from 11 December 2015. Book now.